ALBION, IN. 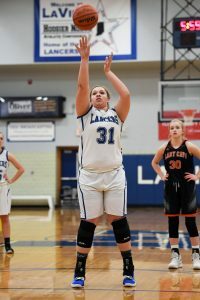 – All LaVille girl’s basketball coach Corey Duncan wanted her squad to do was fight. Not a physical fist-fight, but to endeavor vigorously to win. It was the first round of the Indiana High School Athletic Association Class 2A state basketball tournament. The Lancers drew rival Bremen in the second semifinal round of the Central Noble Sectional Friday night. LaVille and Bremen had round one of the schedule back on November 6. The Lions shoved the Lancers around to the tune of a 60-26 romp. Bremen pressed and harassed LHS into 28 turnovers and just 10 second-half points. Not so much this time around. The Lancers controlled the tempo from the tip, handled the press much better than back in November, and, quite honestly, gave themselves a fighting chance. 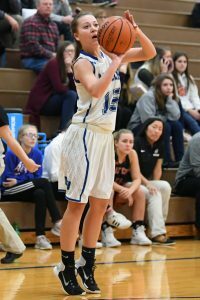 LaVille trailed 6-2 at the end of the first quarter and 19-6 at halftime, but one could tell the Lancers were a little more determined in the second half. LaVille played one of its best quarters of the season during a third period that saw the Bremen lead hold at 29-22 for quite some time. In fact, LHS had five crucial stops with a chance to cut even more into the Bremen lead, but just get a shot to fall. “We were down 13 at halftime and we really had the kids focus on chipping away at the lead,” said Duncan. “We talk about must score and must stop possessions. Our final key of the game was to fight…. fight for 32 minutes and I felt we did just that. As the LaVille fight continued, the one thing the Lancers were not going to do was let Bremen’s top three scorers get easy points. Karlee Feldman, Kaelyn Shively, and Erin Coffel that do a majority of the scoring lead BHS. Friday, LaVille held Feldman to zero points, and both Shively and Coffel below their season averages. It was the first time all season that Feldman had been held scoreless. “Our game plan was to be physical with Feldman and get the ball out of Coffel’s hands and make her other teammates make decisions,” said Duncan. “I felt we did those things and we ruined the flow of their offense because of it. Senior Julia Hall with 10 points and eight rebounds led LaVille. Senior Kelsey Aschenbrenner hit a pair of 3-pointers for six points and handed out five assists. “We are going to miss our seniors,” said Duncan. “I wish Hannah (Filley) would have had more time with us. She does so many things well, just had a lack of experience. Trinity Strange was a type of kid that showed commitment and love to the game. The two with the most experience, Julia and Kelsey, did a nice job and led this young team well. They both played very well tonight. It was their last game and that’s always hard as a coach to watch your seniors leave. After watching her team start the season by taking a hit of 94% of the offense gone, Coach Duncan’s crew continued to work hard and make improvement. 3-point field goals: LaVille 2 (Aschenbrenner 2), Bremen 5 (Foster 3, Shively 2).